Sea lanes are one of the Asia-Pacific’s six “geopolitical stakes” according to Walter McDougall’s magisterial Let the Sea Make a Noise: A History of the North Pacific from Magellan to MacArthur. His interpretative history argues that sea lanes tied together the contest for the region’s other five “great prizes”: the west coast of North America, Alaska, Hawaii, Manchuria, and eastern Siberia. With the possible exception of Chinese immigrants encroaching on eastern Siberia, sovereignty over these land features along the Asia-Pacific rim is unlikely to be contested again as it was on and off for roughly two centuries until 1945. However, the resolution of these sovereignty disputes through war, diplomacy, and purchase has not decreased the significance of the region’s sea lanes and maritime space. Sea lanes today no longer just connect great land prizes, but they and the maritime space they inhabit are stand-alone prizes in Asia-Pacific security dynamics. In fact, Asia’s maritime space is gaining renewed significance and becoming an area of expanding and intensifying rivalries. This trend marks the opening of a distinct phase, following a brief seventy-year period of near dominance by the United States during which the Pacific Ocean was often called “America’s lake.” There are other major discontinuities with the pre- and post-1945 phases that frame the evolving importance of Asian maritime issues to the United States. A first discontinuity from the past is the changing maritime players—and the United States’ relations with them. Russia in effect abandoned the Pacific in 1867 after selling Alaska to the United States, only returning during the Cold War. Even during the Cold War the Soviet Union was not regarded as a serious challenge to U.S. maritime supremacy in the Asia-Pacific; and Russia today is even less so. Spain was essentially eliminated as a Pacific challenger after losing the Spanish-American War in 1898–99. Britain’s Asia-Pacific maritime presence peaked in the early twentieth century but lingered until 1945. There is little prospect of it being revived today even though the relationship between the United States and United Kingdom remains “special.” Japan’s challenge to U.S. maritime primacy was intense, short, and exhausted by 1945. Since then, the supremacy of the United States in the Asia-Pacific has been buttressed by its military alliance with Japan and the use of naval and air facilities there, as well as the latter’s own very capable, though legally constrained, naval forces. The bottom line is that Europe’s once great powers do not pose near- or even medium-term challenges to U.S. maritime preeminence in the Asia-Pacific (and can in fact be better considered as general or niche partners). 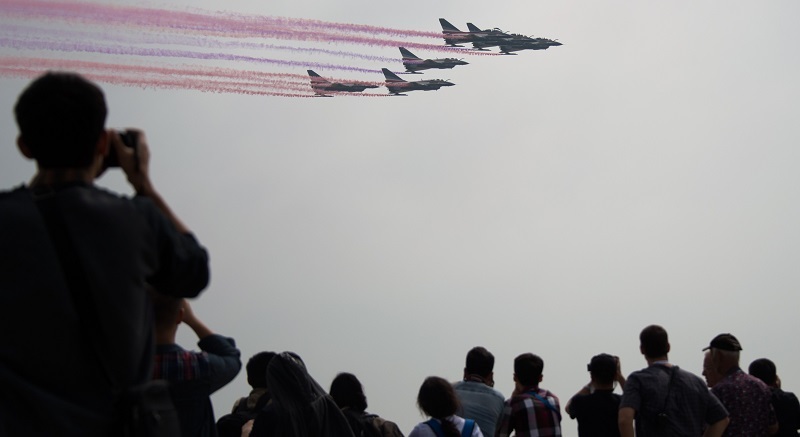 J-10 fighter jets of the PLA Air Force perform above Zhuhai, China, on November 12, 2014. JOHANNES EISELE/AFP/Getty Images. China’s neighbors have taken action too, ranging from reclamation to new legislation to support their own claims to the disputed land features and the surrounding waters. However, the claims of China’s neighbors are far more limited and their assertive actions comparatively circumspect. Meanwhile, China has been locked into a contest to loosen Japan’s administrative control of the Senkaku/Diaoyu Islands in the East China Sea. The escalation of tensions follows the Japanese government’s decision to purchase the islands from a private owner in 2012, taken to forestall further actions by Japanese nationalist groups that would have antagonized China. Finally, China has challenged U.S. naval vessels on the basis that it does not accept the U.S. interpretation that military activities are permissible in another country’s 200-nautical-mile EEZ. China’s simultaneous and seemingly unyielding challenges across all these fronts, combined with its growing capabilities, represent a fundamental change in the character of Asia’s maritime space and indeed the behavior and role of a major power. While China’s behavior is not on the scale of the territorial colonialism practiced by Western maritime powers in the Asia-Pacific, it raises fears among regional states that the ultimate ambitions are the same—to establish suzerainty in a hierarchical regional order with China at its apex. Though the United States, Japan, and China are now the three major naval powers in Asia, for the first time other countries are also notable players in the maritime sphere. India, whose naval modernization lags well behind China’s, could in the future play a bigger maritime role. Australia, by dint of its U.S. alliance, proximity to the South China Sea and Indian Ocean, and not insignificant naval capabilities, also could be an even more important maritime player in the future. And for the first time in their histories, Vietnam and Indonesia—and potentially other Southeast Asian nations—are modernizing and expanding their maritime capabilities with varying goals ranging from sea denial to maritime domain awareness. It is also important not to overlook Thailand’s maritime capacities. The United States’ relationships with this multiplicity of players in Asia’s maritime space range from the alliances with Japan, Australia, and Thailand to the growing competition with China to increasingly successful efforts at partnerships with India and Vietnam and maritime capacity building across Southeast Asian countries. The emergence of multiple new local Asian naval players presents new complexities for U.S. relations with the region. The challenges posed by Chinese military modernization to U.S. naval primacy and China’s ability to act without restriction as a result of its anti-access/area-denial strategy are clear. But there are other challenges too. Because the United States is not a party to sovereignty disputes, does not have any claims itself, has not ratified the United Nations Convention on the Law of the Sea (UNCLOS), and does not take a position on the sovereignty claims of other countries—whether allies or not—the United States must choose whether to confront China directly over territorial claims in order to reassure U.S. allies and partners. There is a trend toward the framing of maritime issues, particularly in the South China Sea, as a central issue—even a litmus test—in U.S.-China relations, largely as a result of China’s increasingly assertive actions. An earlier, calibrated approach that focused more on the China-ASEAN core of the dispute rather than on the U.S.-China elements seems to have receded in the face of a more contested, though still manageable, U.S.-China relationship. A second overarching discontinuity between the pre- and post-1945 periods is the expanding role, interests, and expectations of the United States in maritime Asia under very different conditions. Until the late nineteenth century, the United States, along with other countries, primarily sought access to the Asia-Pacific, and particularly China. After consolidating control over the North American west coast, purchasing Alaska from Russia, and acquiring Hawaii as well as other Pacific territories in the late nineteenth century, the U.S. Navy’s goal of protecting the United States’ sovereign territory in the region became a natural national interest and of course remains so—even if there is little in the way of a direct maritime threat to this control. 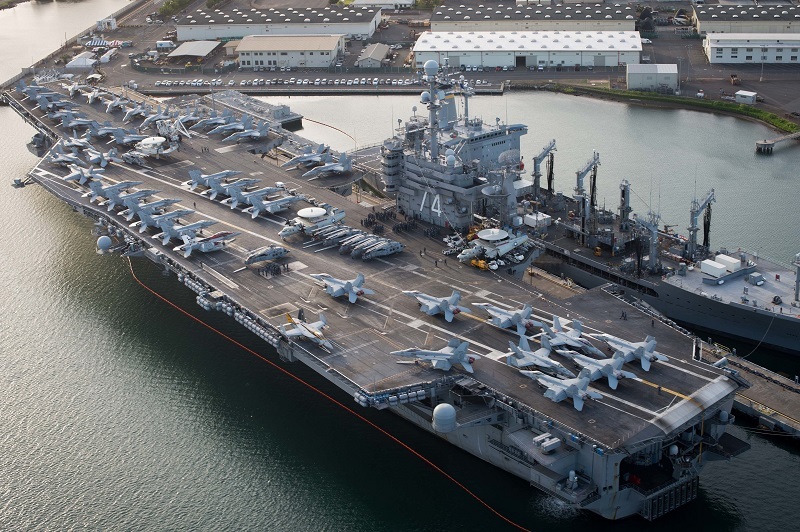 An aerial view of the USS John C. Stennis (CVN 74) moored at Pearl Harbor for Rim of the Pacific 2016 exercise, July 1, 2016. U.S. Navy Combat Camera photo by Mass Communication Specialist First Class Ace Rheaume. Since 1945, the United States has had additional objectives. These include maintaining a balance of power favorable to U.S. interests (i.e., primacy), deterring and dissuading countries that would challenge such a balance of power, reassuring allies and partners of their security, and ensuring freedom of navigation, access to regional commerce, energy and trade flows across the global commons, and respect for international law. These interests must be protected in a region composed of multiple dynamic states, the most prominent of which is China that is reclaiming its centrality after centuries of displacement from the center of economic and military power. Thus, Asia’s maritime issues have grown in importance to the United States. Although remaining the global superpower and shaper of international rules, the United States faces conditions of relative decline and must manage the competing ambitions of allies, partners, and other regional players that differ markedly from its own. A final discontinuity is the geographic scope of U.S. maritime interests. Despite the United States never having a fixed notion of Asia, for much of the period of great-power and colonial contestation in the late eighteenth and nineteenth centuries U.S. interests were primarily concentrated in the northern Pacific, stretching from Alaska and Hawaii across the ocean to the shores of the Eurasian landmass. In 1835 the U.S. Navy established the East India Squadron and a permanent naval presence in East Asian waters that was only interrupted in 1942–44. Starting in the twentieth century with the acquisition of the Philippines following victory in the Spanish-American War, Southeast Asia became of greater significance to the United States. After World War II, and in the context of the Cold War, U.S. maritime interests expanded to encompass the entire western Pacific, including all Southeast Asia (not just the Philippines), as the United States took on alliance obligations to countries located there and sought to prevent the Soviet (and Chinese) threats to the region. With the articulation of the Obama administration’s “rebalance” to Asia, in October 2011 then secretary of state Hillary Clinton described U.S. maritime interests in a “region [that] spans two oceans—the Pacific and the Indian—that are increasingly linked by shipping and strategy” (emphasis added). Soon after, the Indo-Pacific for the first time gained official currency as a geographic concept in descriptions of U.S. strategic maritime interests. For example, the commander of U.S. Pacific Forces Admiral Samuel Locklear used the term “Indo-Asia Pacific” in his 2013 report to the U.S. Congress on the country’s force posture in the region. And a March 19, 2015, letter from the chairs and ranking members of the U.S. Senate’s Armed Services and Foreign Affairs Committees specifically expressed concerns about the “Chinese strategy in the Indo-Pacific maritime domains” as well as the South and East China Seas. 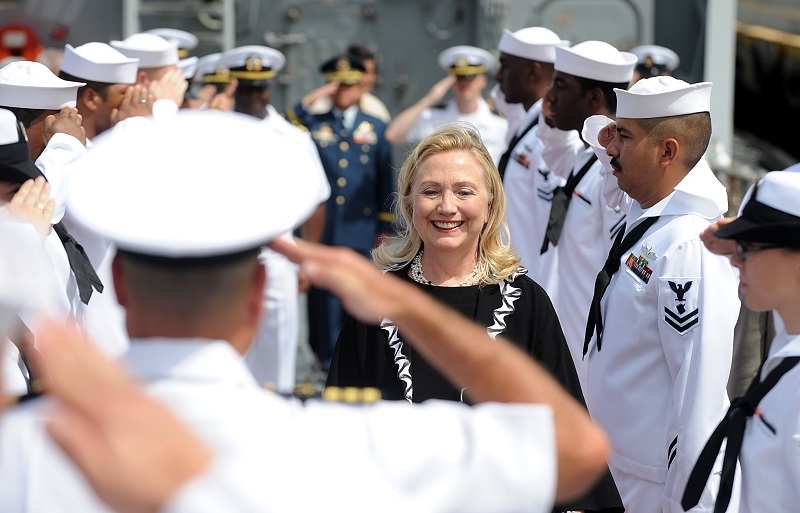 U.S. Secretary of State Hillary Clinton leaves the USS Fitzgerald, a US Navy destroyer, docked at Manila, the Philippines, on November 16, 2011. NOEL CELIS/AFP/Getty Images. Others have questioned the usefulness of this broadened scope. Rear Admiral (ret.) Michael McDevitt, in a study that examines the five major maritime basins that make up the long littoral (the Sea of Japan, the East China and Yellow Seas, the South China Sea, the Bay of Bengal, and the Arabian Sea), recognizes the factors integrating the maritime space but finds “no new or emerging problems of sufficient gravity to suggest a major focus on integrating the Indian Ocean into U.S. Asia-Pacific strategy.” He further concludes that the western Pacific, and more specifically the Sea of Japan and the East China and Yellow Seas, should be of prime importance to the United States because the maritime security flashpoints there (e.g., Taiwan, the Senkaku/Diaoyu Islands, and Korean Peninsula) pose a direct challenge to U.S. interests and obligations. While he allows that given the U.S. alliance with the Philippines, the United States could be directly involved in a conflict in the South China Sea, to McDevitt there is no doubt that the core U.S. interests continue to be concentrated in the northern Pacific. However, given the integrative trade, investment, immigration, and energy patterns across the vast expanse from East Africa and the Middle East to East Asia; the widening reach of Asia’s own major powers as they undertake greater naval, commercial, and diplomatic commitments in the Middle East and South Asia; the possible future role of India in the Asia-Pacific maritime space; and most importantly, the United States’ interests in rules and norms for the global commons, a strong case can be made that U.S. maritime interests must now encompass the Indo-Asia Pacific region. How to operationalize those interests beyond the existing capacity of U.S. Pacific Command, whose area of responsibility already encompasses much of the Indo-Pacific, requires deeper consideration. These three overarching discontinuities that drive and derive from changes in maritime Asia are likely to shape the security dynamics of the region for decades to come. First, maritime contestations will have to be managed rather than resolved. The complexity of multiple, overlapping disputes (even disputes about whether there are in fact overlapping claims or disputes) means that a negotiated solution among all the relevant parties remains highly unlikely. International arbitration and legal rulings might clarify elements of contestations but not the underlying disagreements—and could even exacerbate them. Second, rising maritime interests and escalating disputes will shape relationships between Asian countries—not to mention the United States. Closer ties between India and Japan and Australia and Japan, for example, will have a maritime dimension that was previously less prominent or even absent from these relationships. It is conceivable that two or more Southeast Asian countries (e.g., Vietnam, Indonesia, and the Philippines) will find that they have an interest in expanding maritime cooperation. And certainly extraregional countries such as Japan and India will be more active in and around Southeast Asia. 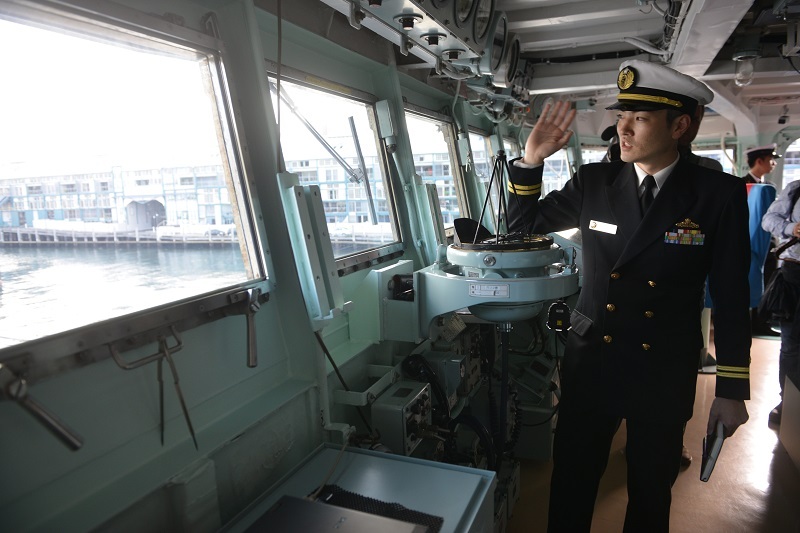 A Japanese navy officer on the bridge of the Japanese Asagiri-class destroyer, JDS Umigiri, docked in Sydney’s Naval base, April 19, 2016. PETER PARKS/AFP/Getty Images. Third, the effort to create new stability-enhancing regional organizations in the Asia-Pacific will be both facilitated and constrained by maritime dynamics as countries seek to use and prevent usage of these forums for articulating and responding to maritime challenges. Though maritime issues will not be the only or even the key factor affecting the future of these organizations, their shadow will loom large over the future. In sum, the implications of new maritime players, increasing complexities, expanded U.S. interests, and a “long littoral” of concern will have important implications for Asia-Pacific security. Nonetheless, it would be a mistake to suggest that maritime contestations alone will shape the future of the region. The United States has already signaled its intention to maintain maritime superiority. But it has also signaled its intention to pursue collaboration with navies across the region, including the People’s Liberation Army Navy. Whether Washington can do both will be determined by its ability to harness, direct, and sustain domestic resources and political and public support. But much will also depend on its ability to balance opportunities to further solidify its alliances, partnerships, and networks in the region with the requirements of managing the U.S.-China relationship. This will not be easy. The pulls and pushes on the United States from allies and partners are in many ways far more complex than the core challenge of managing maritime relations with China. However, the United States has enviable tools at its disposal for handling the new maritime environment, and the balance of power, order, relations, and even narrative all favor Washington. It will need to apply these tools wisely. How the United States will confront the new conditions and challenges in maritime Asia will be a key strategic story of the coming decades. One can expect the clashing sounds of the sea to both change and crescendo across the contested Indo-Asia Pacific. Satu Limaye is Director of the East-West Center in Washington, D.C., and a Senior Advisor at the CNA Corporation. The views expressed are the author’s own. The author thanks Rear Admiral (ret.) Michael McDevitt for comments on an earlier draft. Banner image: © JORGE JARA/AFP/Getty Images. Heavy seas off Antofagasta, Chile, on July 4, 2013.